Forty Mile County in Alberta, Canada, is a rural community that is economically based on agriculture and the oil/gas industry. The Forty Mile Lutheran parish consists of two congregations — Zion Lutheran Church in Bow Island and Trinity Lutheran Church in Foremost — inside the county. Both towns are experiencing significant population changes. The people who grew up and farmed in the community are slowly leaving due to retirement, health conditions, etc. They are being replaced by Mexican Mennonites fleeing the drug trade violence. That leaves the congregations with a shrinking membership and little prospect for growth. The parish is struggling to discover its place in God’s work in this community. One thing the parish has done is free their pastor, Rev. Mac de Waal, to offer chaplaincy services to emergency workers. 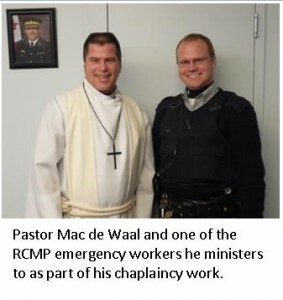 He is a chaplain for the Royal Canadian Mounted Police and is able to spend time ministering to them. His ministry of presence among them allows for an opportunity to witness a life directed and sustained by Christ. When opportunities present themselves to directly talk about Christ or what life looks like under His direction, they are taken. Attempts are being made to expand that service to other emergency personnel. The congregations support this ministry by prayer and financial backing for any material items the pastor may need to do the work.They also feel more connected and conscious of the emergency workers in their communities and provide a level of continuity in their witness of Christ to these people. 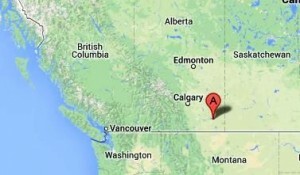 To learn more about Forty Mile Lutheran Parish, contact Pastor Mac de Waal at pastormac@telus.net or 403-952-7817.